I have strange kind of personality traits. I’ve been considered very dynamic and responsible from childhood by my teachers, parents of my friends and even servants. They had blind trust on me. I also never broke their trust or let them down. I did the best I could to accomplish the assigned task. I am known to be very refined and well mannered officially J but — believe you me, I can’t resist to eat whatever is served in friends’ partyJ I just can’t wait for anyone, young or senior. I told my Chinese boss too, when I stayed with them on a training session, that he may get angry with me for anything I do wrong I won’t mind, but I can’t wait for him to start eating first. When I’m hungry I just don’t follow any rulesJ and he always was very kind and caring. I ate my dinner twice when my husband’s dead body was brought home. When I’m upset I eat lot more. I rise early and sleep early. I never studied late in exams from preschool to University level. Ate more slept more, watched movies, painted, sang and played my guitar when depressed. I was very composed and serene at home, but, as a student, I was very naughty and playful. It was when I was in grade 8th in Presentation Convent. Mother Regis was our class teacher. Being short in height I sat in front seat. When I cracked jokes the whole class roared of laughter. When I won trophies and prizes in debates or literary contests, earning, laurels from my teachers and friends my father used to say, “You know nothing but have created an impression of yourself on others.” J Parents know their children inside out. I never harmed anyone! When I felt really, truly lonely? It was 29th March 1984, the day, when I felt most lonely in the world. 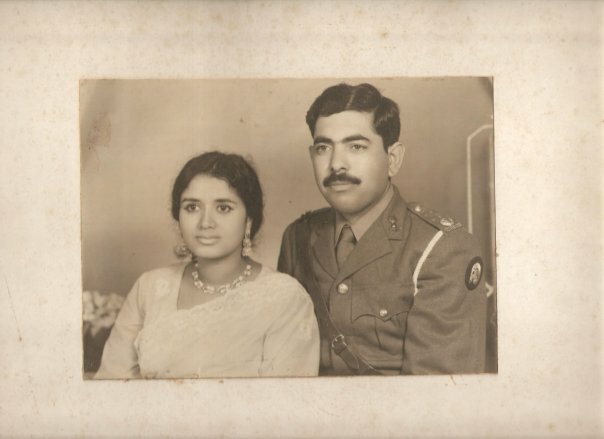 My husband Major Rauf, passed away leaving me with four small children. When his body was taken away for burial, I was dumbfounded and helpless to the core of my heart. I felt standing on water. Though the house was full of relatives, friends and neighbors but it seemed absolutely haunted empty place to me. Even the passersby felt sorry for him, as he was only 38 and I was 35. We lived in a rented house. No money, no source of income. My brain refused to accept that he was no more. So unable to bear the grief got nervous breakdown. It’s a long story of struggle. Now all my targets achieved, mission completed. My children grew up into beautiful humane human beings. They are married now. I am a grandmother of 6 adorable grandchildren. But, whenever I look back I shudder with fear and amazement. It seems a dark period. I was absorbed thinking about some topic to write on when all of a sudden the telephone bell disrupted me. My old friend Sabiha was on the phone. It was a pleasant surprise to hear her. Both of us being occupied with our chores hadn’t met for quite long so we set time to meet at her home on Saturday evening. As decided i went to her home. I rang the door bell. And within no time Sabiha opened the door. She was also eagerly waiting for me. Sabiha greeted me with same warm smile like always. The environment she has created in her home is very comfortable and pleasant. One feels at ease and at home in her simple but artistically set home. She’s not only a good cook is a very amiable host too. Home made munchies with fruit were set on the table to enjoy our friendly heart-to-heart talk. She is serving as an Administrator in a school run by a reputed NGO. I told her about my freelance writing. But I insisted to unveil her life story just to encourage other hundreds of ladies like herself who may possibly follow her footsteps and live with bliss, self-confidence and opulence. Elite class has means and sources and does not face the bitterness of life as common people do, so they need to be encouraged. Her talk can be a landmark for one or many. Every one is born with a purpose set by Almighty so Sabiha may provide a path to follow or inspire some to boost up their moral. Sabiha modestly agreed to unveil her struggles and turmoil, which she carried like yoke on her shoulders after her husband’s demise till date. I requested her to answer my questions in line with the sequence. Tanveer: when and where were you born Sabiha? Sabiha: with a smile and taking a sip of coffee she replied that she is Virgo and was born in Karachi on 19th September. Tanveer: will you please enlighten us about your educational credentials? Tanveer: what are your sons Babar, Umair and Sair doing now? Sabiha: All three sons masha Allah graduated from LUMS. Two of them are married. I have one grand daughter too. Tanveer: you were a very submissive type of a girl. How did your husband’s death influence you? Sabiha” My husband’s death taught me that I had strength I was unaware of. With widowhood came the surfacing of an inner self. I have learned, though it took a few years, that pain is a natural part of living. We grow by losing n leaving and letting go. Tanveer: I am impressed with your practical approach towards life. Would you share how your husband died? Unfortunately he got heart attack on 8th May and breathed his last on 9thMay 1993. Sabiha: In every new experience happy or sad there is need to let go of what WAS until we do that, we can’t appreciate what’s IS. Sabiha: The best and most beautiful things in the world cannot be seen or even touched. Sabiha: Yes I served Hamdard for 11 years. I worked in two shifts in Hamdard to make my ends meet for all 3 sons were studying. I worked in Hamdard village school in evening shift along with morning shift. Tanveer: how was your experience inVillageSchool? Sabiha: Tanveer I observed poverty very closely there and felt the agony of appetite, poverty and poor health. Being sailing in the same boat I could only alleviate poor students with my kind words and care. I gained their love, trust and heart felt gratification that I treasure a lot. Tanveer: would you mind if I ask you something personal Sabiha? Sabiha: smilingly she said, in a hot, dry season, a tiny drop of kindness makes the world healthier and more hopeful. Tanveer dear your company is a pleasure for me so you can ask me anything! Tanveer: was your salary enough to execute your requirements? Sabiha: To be honest no. I believe in dignity of labor and have no reservations in saying that I gave coaching in the evening, sew and designed dresses and bed sheets and exhibit them for sale. I got what I did in return for good mind, good finds. Tanveer: Did you face any problem with authorized departments? Sabiha: would you believe me Tanveer that departments like KDA, PTCL, KESC, POLICE all helped and solved my troubles with kindness and respect even so they have no high-quality repute. But where there is a will there is a way. I trust Allah so I over came all hindrances. Tanveer: you are right Sabiha; God helps those who help them selves. Tanveer: any message for readers? Sabiha: My message for one n all is to please give time to yourself along with people around you. Enjoy life, as it is beautiful gift of God. You never repay who help you in your trip through life, but you can pass on the payment. It will give you inner peace. Tanveer: Why did you not remarry nor do you miss partner? Sabiha: I did not remarry for stepfather is crueler. He lacks endurance. He fails to tolerate forgive any shortcomings of other man’s children. Hence I sacrificed for my children’s’ betterment. How ever one needs a companion to share pains and gains. Tanveer: Thank you Sabiha for your time and enriching me with your positive and consistent efforts to enjoy the colors of life. God BLESS YOU. Though cinder means coal or ashes but I being an educationist regard cinder as diamond, for coal being the foundation of diamond. It is commonly known that diamond is very precious and as a result costly too. It dignifies and enhances the owner’s personality. The more it is translucently and vigilantly cut in shape the more pricey it is. Children are like cinders. They need special care and kinder to grow and glow like diamonds skillfully. Just like a plant needs air, water and sunlight to grow lustrously, so does a child needs lots of love, care and faultless training for their character building. Having vast and rich experience in this field, I have always enjoyed working on them, for them and with them. They are the undiscovered world of valuable treasure. Each child is a world in itself. Children and flowers are true reflection of the Creator. The closer you get to them the more you cherish and relish. When we moved to Karachi from Faisalabad I took my son Bilal to many schools for admission; but I got disheartened when I saw the books and talked to teachers. The reason was simple. Books were costly and of higher standard compared to the standard of class. The tuition fee with other charges was too expensive. Above all, the teachers did not have adequate knowledge as expected. Bigger the building and locality, the higher was the fees. So I decided to open a school of my own where I could educate my children besides. Though I had no previous experience but love for education and children both motivated me. My aim was to impart and instill the values and virtues in the fresh minds what we learnt from our teachers. I remember the Irish nuns, in Convent School never asked us to speak truth or be honest. They projected characteristics of a good human being practically. We followed our teachers’ footsteps religiously. I am genuinely grateful to all my teachers. My school got name and fame in discipline, quality education and co curricular activities alike. Our students won many laurels while competing with other schools. It was smoothly running but a fatal tragedy in the family made me close down the school with a heavy heart. After the demise of my husband I joined Mama Parsi Girls School. It was an enriching experience to teach in a renowned school. I learnt immensely from the system and also from the students. The strict discipline and amiable teaching stimulated me more. The rapport between my students and myself earned me deep regard and gratitude. Every day without fail I was presented with flowers and warm promising smiles which lessened my tensions. I gave them nothing in return except kinder, attention and education. To make them feel grateful to Allah for giving them health from head to toe I took my class to a leprosy centre. Children gave gifts packs to the patients and charity to the management. It was a memorable experience for all. The drive to do and pass on more instigated me to move on. I served in many learning institutions. What I found out was that every child is individually different.Thus a teacher should handle the situations according to a child’s needs and moods using psychological tactics. There was a girl who played with flies rather than doing her test. On asking she said she wants to play. Agreeing with her she was made to sit in the patio to play with flies. After few minutes she got fed up as expected. After that she did well in the test. Another chubby boy refused to do his test. He did not want to write because his friends were not there. When assured that his friends will also join, he did his best. The conclusion to this entire write up is that, a teacher has to play many roles. At times she has to be a friend, a mother, or a strict teacher.In fact a real teacher is like a craftsman who skillfully discovers the latent ability of a child. Ironing out the short comings and illumining the spark prepares cinders to diamonds to serve humanity with dignity and undaunted endeavor. Gems, jewels, diamonds, gold platinum and other precious stones are stuff that add beauty, upgrading the status of that who owns them or wears them, but as it is rightly said that: when wealth is lost, nothing is lost, when health is lost something is lost but when character is lost,everything is lost. Often the possessor feels arrogant looking down upon the ones who do not have this wealth. Such wealth creates distance between hearts and souls but luckily my gems and jewels are the truly humane human beings, who taught me some great lessons. They purified my soul with their words and deeds.In fact,what I am today is the reflection of my gems’ unobserved character. Golden memories of my ‘Gems and Jewels’ date back to my childhood. Sabro (meaning the one who is composed and has patience) the middle-aged lady worked in our home as full-time maid. She was very cool, calm and collected and a caring lady. 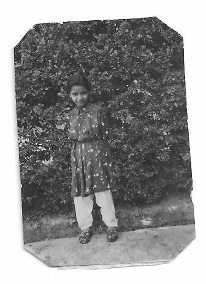 She used to sing Pashto songs in her husky voice and tell me stories of her childhood which were of great interest and curiosity to me. She not only entertained me with her songs etc, but she carried out her duties very faithfully. Her diligence was unmatched too.Peshawar is in north of Pakistan and it’s one of the oldest cities of the world. Peshawar has all four seasons. Winter is extremely cold n summers are sizzling hot. Autumn is dry and depressing while spring is full of lush green grass with all colors of beautiful mesmerizing sweet-scented flora. Sabro usually did her stitching and needlework in hot summer after noons after finishing her other duties. Having weak eyesight she found it difficult to thread the needle so always looked at me with a pleading smile to help her. I was always ready to do so. Being a child I was not allowed to play with sewing box. Since this sewing and stitching activity was done in the afternoons so there was no danger of being caught and scolded by my mother. I quietly tiptoed from my bed and joyfully helped Sabro. Once she got very ill. As no one else could speak or understand Pushto so I was her only friend. She asked me to call her son. She wished to be with her family. Her son came and took her with him. After few days I sent a message for her since I missed her very much and got to know from her same son that Sabro passed away peacefully the day before. He said that Sabro missed me too. I can still see her kind smiling face in my imagination. I am sure she’s in her finest place in heavens. She was the only friend I had.She cultivated in me that friends are like fragrance having no boundaries, regardless of color, cast religion age or status. Since we had no neighborhood and I wanted some one to play with so developed friendship with our sweeper’s son Peter. He was my age.Grace the sweeper was a very clean and good-natured woman so was her son. Our Parsi teacher Miss. Narjis Gai taught us that sweepers are the noble class. They are to be respected more as they clean the trash we spread.I religiously followed my teacher’s advice. Grace like her name instilled in my brains that cleanliness is not the feature of the rich community only, where they work or whom they work for but cleanliness is Godliness! A very tall fair old man having broad shoulders and strong bones with straight posture with white hair and white beard white and eye brows came every weekend with a big basket full of eggs. He sold eggs. He was very handsome. He wore roses in his cap and decorated his basket with roses too. Red roses and white eggs looked beautiful. He called me elder sister though I was a small 9 or 10 year old girl where as he touched his 100th year 😀 An old lady also came to sell eggs, hens and chickens. She was very jealous of that Baba because Baba always came before she did. She would not understand when I told her that, early bird gets the worms :). Grumbling and abusing Baba, she used to leave. Baba taught me the dignity of labor at every age and in all seasons of life. He did not depend on his sons though he had 5, 6 sons as I recall. He earned his bread’n’butter himself. The dairy man was another well wisher and my friend. Whenever and whereever I went for shopping or went to my friends’ homes, my nephew, niece, Gulsher and my dog Boofy accompanied me. Every one in Peshawar Mall Road knew us. It was hot summer day. We all were coming home on foot from my friend’s home. It was common to walk in those days. So the Army dairy milk man dressed in his uniform with big mustaches saw us walking in burning sunlight. He stopped his horse and carriage. He called us. I missed my heart bit fearing the harsh words from him. He made us sit in the carriage n dropped us home scolding all the way that why were we roaming in the hot summer day. Boofy came home running behind. In those days any elder person could easily guide scold children for their wrong doing. No matter which class they belonged to, parents would not mind either; rather they thanked their seniors for being so caring. We were in Mardan. There was an old Pathan lady. Every one called her Adday meaning the aunt. She taught holy Quran. I also availed the opportunity. She had grey hair. Wrinkles on her face but her grace made her very beautiful. When she came to teach Quran she wore black, golden’n’silver embroidered velvet gown in winter and chocolate brown cotton gown in summer. She was small in size and a fragile lady. Walking with a stick she looked adorable. She taught that teacher should be gracefully dressed, punctual and regular no matter be it freezing cold or burning hot.I learnt dedication from her. The tailor whom we called Lala (meaning brother) was such a gem of a person. He was not a rich man. He practically proved that to say good bye to someone dear to you is to give gift as a token of love and invite them for food. My husband was transferred to Faisalabad. So before we left Mardan, he invited us over lunch. He brought horse driven carriage for us to take us to his village. He came riding his bicycle behind us. His wife served us luxurious lunch and presented me a healthy hen that laid eggs as a gift. He did not let me pay the fair of the Tonga as I called him brother. In our custom brothers never let their sisters pay for anything.This shows how kind he and his family were. They were real civilized people who believed in traditional values’n’virtues. He came as he promised but not to take me. He brought with him, hot spicy biryani, sizzling kebabs and cooled custard. We all had delicious lunch with him. Since then he has been like our family member. He has moved to his village in Multan. He calls me often n visits me when ever he comes to Karachi.I cherish his innocence and purity of heart. Gusher lived with his parents.They were seven brothers including him and had one sister, and they all used to live in our servant quarters. His mother was a very pious woman. She wore white cotton clothes. She washed her children’s clothes and her’s daily and made them take shower daily. Her small quarter had a very neat’n’clean feeling. In hot summer days she used to serve us, the children with crushed ice mixed with brown sugar. It was a treat for us. They did not have electricity or electric fans. We also never felt the need for any fan either, though Allah had provided us with all facilities but life in our times was above all this pomp and show or status complexity. Her cleanliness and God fearing habits helped her family live a simple and righteous life. Gusher’s brothers are designated at high level posts today due to their hard work and honesty.3 years back when I went to Peshawar they welcomed me warmheartedly. A lavish and plentiful dinner was served with an expensive shawl as a gift by Gusher’s mother. This is tradition of Pathans that they give great respect to their guests and before departing they also present gifts as token of love. I wish them all a very happy fruitful life always. Other gems of my life are Shahid, Fayyaz, Iqbal and two Irshads. Shahid and Iqbal worked as office boys and Fayyaz worked as their supervisor in the Chinese company where I worked as health consultant.I usually had lunch with them which gave them gratification. Fayyaz daily brought hand made bread for me specially. Shahid always made sure to present me with mangoes and oranges according to seasons from his own gardens in Punjab. Iqbal though working outside Pakistan but he calls me often just to ask my well being. None of us now are in the company but they were true,sincere feelings and the respect we had for each other is still in practice. One Irshad was sweeper in Hamdard School. When I went after few years to see my friends’n’colleagues she was there too. I embraced her which was like something divine for her though it gave me immense pleasure to see her there after so long. Other Irshad is still working at my daughter’s home. She’s a wonderful lady. She is always smiling and compromising. We leave our house open to her when we go out with full confidence. She’s is very honest and beautiful young lady. I never see her frowning if guests come or she has to do extra work. I consider myself very fortunate to have come across such great people. They are the ones who should be loved and respected. They are true Pakistanis. I am proud of them all. May Almighty Allah shower His blessings upon them and keep them satisfied with what they have and keep them away from greed and selfishness which prevails all around. Twits and wits – some more! After clearing my tenth grade in First Division I applied for admission in the 11th grade. A week after submission of admission form was my interview.The day came and I appeared before board.It was the first interview of my life. After that they had no heart and patience to ask me any more question so, I was asked to wait outside. I don’t know on what ability or capability but I was given admission 😀 After a few months the debate season came. Having read Urdu novels from childhood, I had clear pronunciation and fluency in Urdu and English both. I was nominated for all Pakistan Urdu debate. The day came. My name was announced. I went to the stage and stood behind the dais but the rostrum was higher than my height. The hall started hooting.I folded my speech put it in my pocket and went to the centre of stage and stood there for some moments peacefully. The voices died. I started my speech and after I was done came back to my seat. When all the speakers from different cities ‘n’ colleges were finished debating, the result got announced. They started from the one who stood Third. I clapped bigheartedly and kept applauding for the Second’n’First with same warmheartedness till my friend pinched me hard on my hand and said: “Stupid it’s you. Don’t clap for yourself idiot.” Was I a fool or intelligent 😀 decide it yourself friends! I was in 3rd year of college. There were elections for the college union. Rehana Malik was my class fellow. She was a very good student and had all qualities of a good human being too; but her short temper did not let her have a big circle of friends. So, she asked me to motivate others to vote for her as as to let her win the elections. I promised her to do so. Bilquis was my very dear and close friend. We sat next to each other in class. She was a very composed type of a girl. Though we ate, sat enjoyed and shared everything together but quarreled all the time just for nothing. One day we went to buy some cosmetics. I did not know that there were full size mirrors behind our back. So, when I looked in the front mirror I saw a girl with very thick shiny black hair braided. I whispered in her ear to see the beautiful hair this girl had. She gave me a knock on my shoulder and said,”Stupid, that’s you! ” The shop keeper smiled naughtily and I felt most brainless girl in the whole wide world. We had some girls in our class who were not very good at English. So, I did assignments for each one of them. I wrote different matter in every book so as the teacher might not catch them for copying. As a result all my knowledge and ideas came to an end so I did not do my own assignment. I was a debater so the teacher always thought that she has seen my assignments and fortunately never asked me to show my copy to her. I got delightful bliss to help others. This remained a secret till today. My life is full of joys and sorrows. Being happy go lucky I shrug my shoulders every time and keep moving ahead. I am the fourteenth child of my parents. Amazing, isn’t it? 😀 But it was affordable decades back to have so many mouths to feed; and as I assume it was the only activity parents had together as there was no media to keep them alert on heels and toes by Breaking News so repeatedly, neither were there any captivating and charismatic fashion and music shows or Internet, Internet the fantasy land, where fathers could enjoy by chatting n watching programs of their pick. So, in short I was the fourteenth winning star of their luxury time. Unfortunately I saw only the eldest two out of seven brothers and six sisters including me seven, for 12 of my siblings had passed away before I was born. Let’s overlook how and why they died. I was n am even now, very soft and kindhearted. When I grew up to be called sensible I learned First Aid. So, every Sunday all ailing children and relatives of our servants used to come to get free shots and dressing of their wounds from me.Poor simple people preferred free treatment so they came to me. I loved to serve them. Gulsher Khan was our full servant. He was very sincere and faithful. One day while plucking figs for me he fell down from the tree. I was studying under the oranges tree. He was badly hurt. He had broken his ulna bone. At that very moment I was reading how to take care of such incident. So, I hurriedly gathered two sticks. Tied the stick, wound the bandage firmly and put his arm in the sling. This is how it was written in the science book. 😀 I asked him to go to the hospital but he believed in my treatment so much so that refused to show to the doctor. As a result, even today at the age of fifty he has same deformed arm but both of us never shared this with our elders. Every Sunday an old beggar regularly used to come to get one rupee coin from me. One Sunday, he came to get his coin as usual. I didn’t have the change so I asked him to follow me. I went to two of my friends’ home in two different areas. The distance was more than 2 kilometers. He followed. I asked my friends to serve him too. He enjoyed and ate all what I ate and drank. Then finally I went to the shop to get the change of a ten rupee note. Well it’s not the end of my follies as I have many such silly happenings in my life. If you like I can share with you next time. Until then keep smiling 🙂 Wish you all happiness and success in life.